On Friday, we took our Girl’s football team and the Year 3/4 tennis team to the annual School Games competition at Stoke Mandeville Stadium. TheSchoolGamesinvolves 1500 young people, representing theirschooland competing against other Buckinghamshire and Milton Keynesschoolsin 13 different sports. 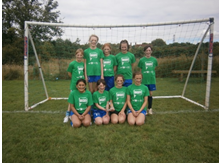 The girl’s football qualified as they won their League in the Spring term, scoring over 10 gals in the three matches. The tennis team qualified as they won a Misbourne tournament, winning almost every match. On the day, the girl’s football team went unbeaten. However, due to the short length of matches, we found it difficult to break defences down. We only conceded 1 goal all day but unfortunately missed out on the semi-finals by one point. Just before we were about to leave, the organisers came to find the girl’s and explain we could not leave the day unbeaten and without a trophy. We were therefore awarded the ‘School Games Fairplay Award.’ An amazing achievement to cap an amazing two years’ worth of hard work. The tennis team qualified as they won their competition earlier this term at the Misbourne tournament, winning almost every match. On the day, the team were fantastic winning majority of their games. This then allowed us to progress to the final where we played Portsfield Primary School. The final was exhilarating with Oscar and Caia both winning their games and John narrowly missing out by 1 point, this left the responsibility to Ruby. In her final game Ruby showed a true Growth Mindset as she came back from 14 – 9 points behind to level the game at 16 -16 points each. The game was won by Ruby in a nerve-wracking last rally, which lasted 2 minutes! This resulted in Great Missenden winning the Buckinghamshire and Milton Keynes School games Tennis event, a fantastic achievement. Congratulations to all those involved it was a truly amazing day.